This was our first event hosted in the City of Monterey after four years in Santa Cruz County. We provided test drives (including electric bikes, an electric vehicle display, and hosted one of the largest displays of mini-replica solar electric cars built by students. 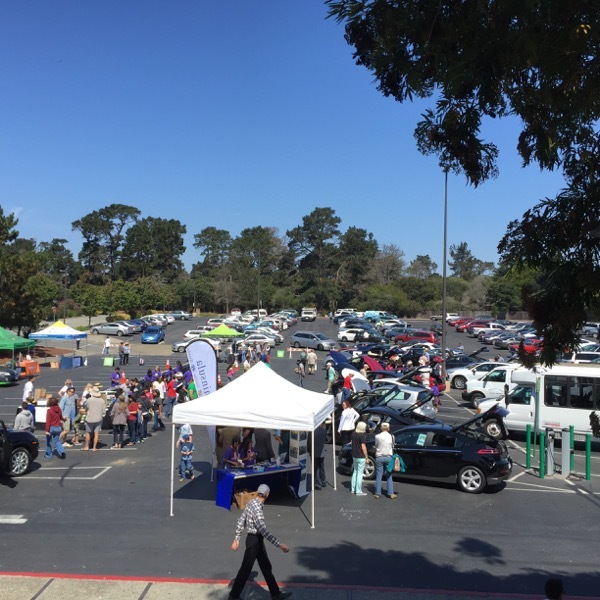 The Monterey Bay Electric Vehicle Alliance and Ecology Action will be hosting Drive Electric Day Monterey Bay! We are excited to provide a large electric vehicle display area featuring many of the most popular EVs on the market today. Many EV owners and local EV dealers will be on site to answer questions and talk with attendees about their knowledge and experience. In addition, the event will feature a Ride & Drive area where attendees will have the chance to drive various types of EVs. Join hundreds of Monterey County students who will attempt to set a World Record for the largest display of mini replica Solar-Electric cars handmade by students! If you would like to have your child participate by building one, contact Richard at richardtavener(at)gmail.com. For event questions or for more information, contact Emily at egomez(at)ecoact.org. Registered attendees report 127,200 electric miles driven.